The Actual outside diameter (OD) of a pipe is larger than its name: Nominal (nominal means “in name only” from Middle English nominalle meaning “of nouns). Use the table below to cross reference the Actual OD (outside diameter) of the pipe to the Nominal Pipe Size. For pipes larger than 12”, the Actual OD is the same as the Nominal Pipe Size. 1. Direct Diameter measurement is the easiest. Measure at the end of the pipe. 3. Measure circumference using a flexible tape and divide the outside circumference by 3.1415. Here the circumference is about 1/32″ (0.03″) less than 6″ = 5.97″. 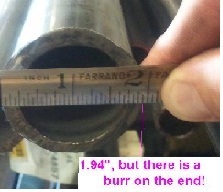 So 5.97 ÷ 3.1415 = 1.900″ diameter – 1 1/2″ nominal pipe. Many people like using pi tapes to measure the pipe size. Pi tapes, which wrap around the pipe the same way but have units in diameter, can be expensive. With calculators everywhere today, dividing by 3.14 is a snap, making these pi tapes not even necessary. In fact, even using an inexpensive sewing tape works fine! What Grade of Pipe Should I Specify to Bend Tubing? How to Check the Radius on a Curved Segment. When to Bend Pipe with a Mandrel and When to Roll Pipe.